Overnight, we dodged as many crab pots as we could and, luckily, didn't tangle in any of them. Even miles out into the gulf they were there. We had hoped that after a reasonable distance from sight of land they would not be there, but they were. Their numbers were diminished, as compared to further inland, but not entirely. For the first half of the night, we experienced calm winds, but at around 3am the winds picked up and the seas went from 1-2 feet to 3-4 feet. Additionally, the direction of the wind changed so we took it mostly on our port beam. It was still very comfortable though so we happily moseyed along. At a few points in the night, hours of travel time into the gulf, and mostly when I was awake, we encountered a bunch of shrimp boats almost in every direction. Some were close to us, others so far that they were just a glow of light in the darkness. This is the best picture I got of one of the closest shrimpers. My camera didn't seem to know what to do with the bright light in all the darkness so this is as good as I got to a real picture. It, at least, gives you an idea of the brightness of the lights they use to fish with. I'm not so sure why it is so blurry, it seemed clearer when I took it. Sorry. Travelling in the dark all night was something new to me. Bruce had spent some time in his youth experiencing it, but I never had. It was interesting. I thought I'd be much more uncomfortable with it than I actually was. It felt more peaceful to me than fearful. It felt odd being out of sight of land for so many hours at a stretch, but a quick glance at our navigation screens showed me we were right on track. An occasional check at the compass also confirmed that all was well. And, indeed, come first light as we were approaching Key West we were exactly where we were supposed to be. 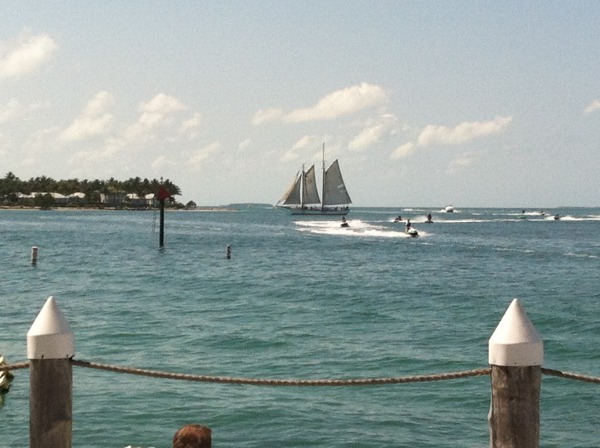 And here we are approaching Key West: There are usually some monster-size cruise boats on Sunset Pier every day. We happen to know this one just came in because we saw it entering the channel ahead of us. 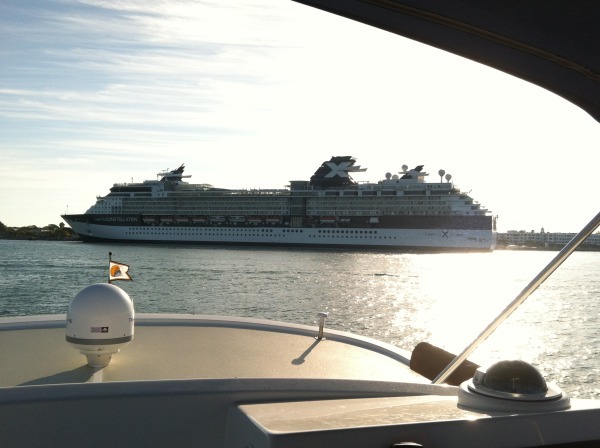 Besides, the rule in Key West is that ALL cruise ships MUST be off Sunset Pier before the sunset every night. No exceptions. Key Westers are nothing if not extremely passionate about their sunsets. This is the Celebrity ship "Constellation". 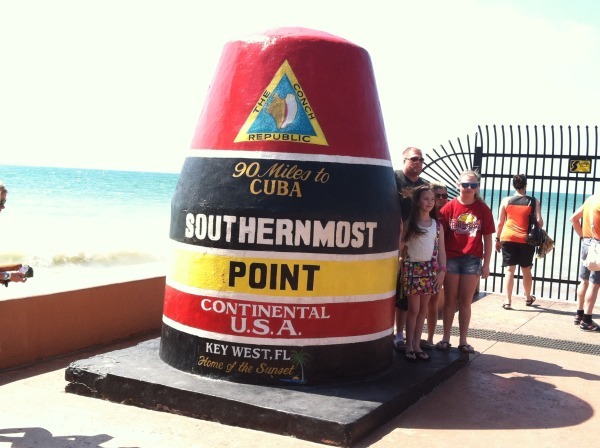 While in Key West, we stayed at the Galleon Resort and Marina. 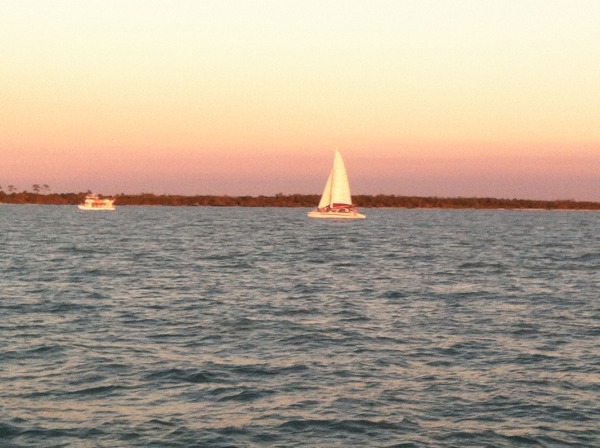 It was definitely the best marina in Key West if you are going to live on your boat. Its proxiity to the outside bay is perfect and the view for us was constantly entertaining and beautiful. Most of the other marinas are tucked into land a bit more so their views are more of the back of someone else's boat. See what I mean? This is the view right off out stern. 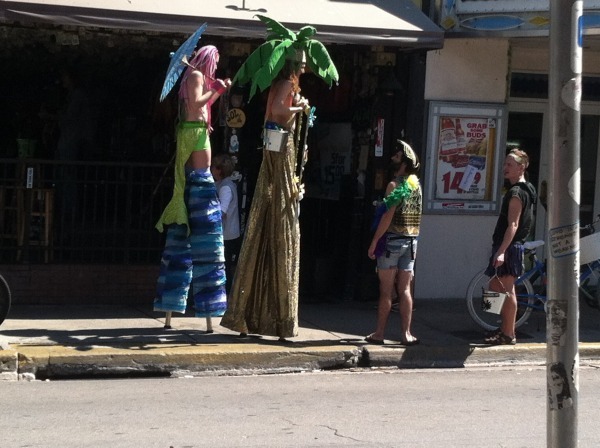 By the way, the guy to the right of the stilted ladies was doing the "pirate thing", too. I think the guy to the farthest right was just gawking. We saw these ladies from a cafe where we were eating lunch. They walked from street to street surprising everyone (kind-of). 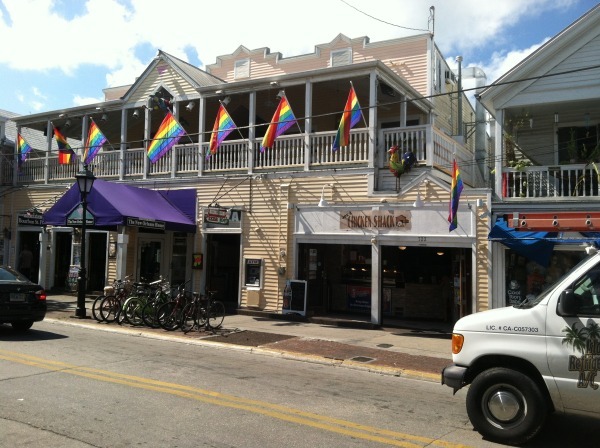 This is Key West after all. Everything here is fair game. Oh, and (i know this is an inside joke but...) they have US Foods here too. They are everywhere haunting me! Our last day in Key West brought a bout of heavy wind as a frontal system came through. Few boats went out and those that did we decided they were crazy. I know, it doesn't look like much but it was windier than it appears in photos. When we came outside it really just slammed us. The plan is to take off first thing in the morning. The wind is supposed to calm overnight. Tomorrow we travel what is called the "hawk's channel" into the Atlantic and off to Marathon.